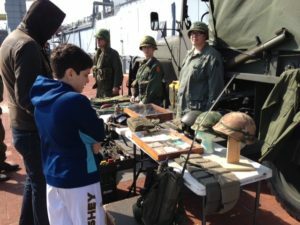 Experience Vietnam War artifacts, re-enactors, veteran interviews and even late 1960s music over the pier’s PA during the Battleship’s annual Vietnam War Living History Day, Saturday, April 6 from 10am to 3pm. Vietnam artifacts will be available for guests to check out in the Officers’ Wardroom, while re-enactors will be throughout the ship. Our curatorial staff will also interview Vietnam vets, who will share their experiences during the war. All activities are free for guests to experience with the purchase of a Turret II guided tour or a Fire Power audio tour. The Battleship welcomes any Vietnam War artifact or military vehicle owner or re-enactor to participate in this annual event. For more information, contact events@battleshipnewjersey.org or call 866-877-6262 ext. 144. The USS New Jersey was commissioned for Vietnam on April 6, 1968. She was the only battleship that saw action off the coast of Vietnam in 1968. Guests touring the Battleship can experience an exhibit that features her commission as part of the Battleship’s Fire Power Tour.